Bison roaming the prairie in winter at Nachusa Grasslands. That started to change four years ago, with the introduction of bison to Nachusa Grasslands, a 3,500-acre preserve just 100 miles west of Chicago managed by the Nature Conservancy. It’s the first conservation-oriented bison program east of the Mississippi and the results could inform prairie management around the country. Early returns show the bison reintroduction has been a success, and the animals are already having surprising impacts on the grasslands that could be making it healthier. That’s a big deal for such an imperiled landscape. Nachusa Grasslands has been around since 1985, after conservationists recognized the remnants of the prairie hiding on what Bach generously called “knobs” being used for cattle grazing and decided to buy up the land. For the past three decades, the landscape has been meticulously restored to some semblance of what it once was. But the focus has been largely on getting the plant life right, a common approach in restoration. “They” in this case aren’t dead baseball players, but native animals that once hung out on the prairies. The plant-focused restoration approach can work if you want to attract birds and other creatures that can easily cross a fragmented landscape or that are already migratory. But it’s not like bison in Yellowstone are just going to up and make their way to Illinois. And without them, it was hard to really gauge if what was going on Nachusa was a success. 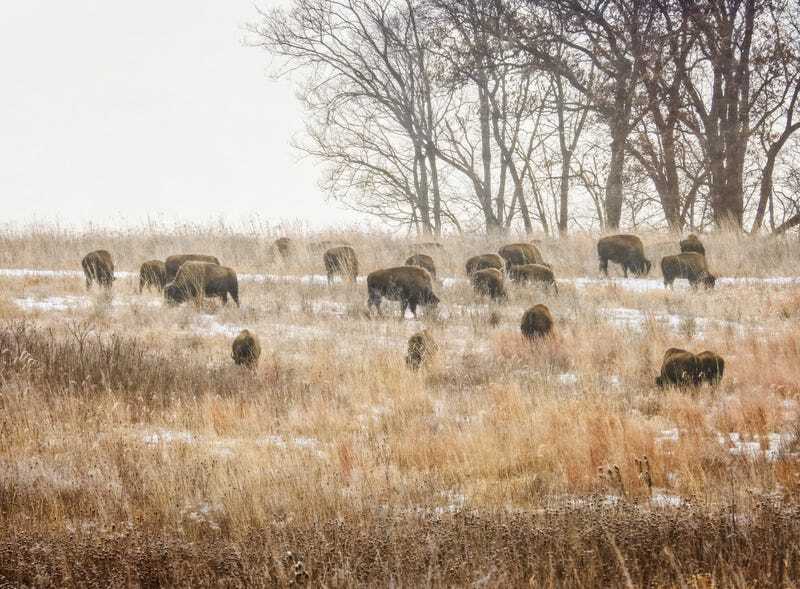 That led to a momentous decision in 2014 to relocate 30 bison from Nature Conservancy-managed preserves in Iowa, Missouri, and South Dakota in what became the first-ever attempt to rewild the prairie this far north and east. Since then, the herd has grown to 95 individuals including what are likely the first wild bison to be born east of the Mississippi since the mid-1800s. The herd has free rein of 1,500 acres of the grasslands. To tease out the impacts of bison, the science team at Nachusa, along with outside partners like Jones, have set up 22 exclosures ringed with electric fences to keep the animals out. Since the herd has only been around for a few years, the results are tentative, but Jones pointed to a few changes both expected and unexpected. The tallgrass prairie and woodlands of Nachusa Grasslands. Bach was brought on as a restoration scientist to continue collecting long-term data on the site and share it with partners. One area she said will be of particular interest going forward is the interaction between bison and fire. “We know bison like to graze on areas recently burned because new grass growth is particularly nutritious and easy to digest like eating baby kale as opposed to full on kale that’s gone wild in the garden,” she said. That relationship could change over time, or grazing bison could even reduce the need for regular fires to maintain the ecosystem. In addition, Bach said they’re also seeding new plants from nearby prairies. That could further change where and what the bison eat and lead to yet more cascading impacts on the ecosystem. It’s a fascinating large-scale science experiment that only takes a day off each year for the annual bison roundup to check on the herd. The public isn’t allowed into the bison zone, though they can be viewed from the visitor center. 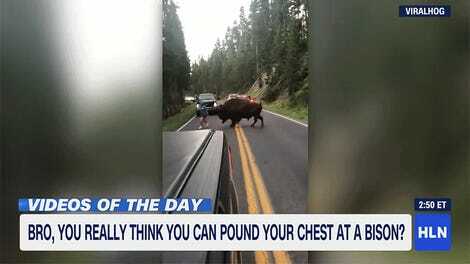 And when the researchers go in, they give bison a wide berth for both safety and ensure they don’t get used to humans. “It’s a natural area and our goal is to to let nature have the space nature needs to do what it does: evolve, adapt, and change,” Bach said. They don’t always succeed, of course. Despite their ponderous nature, bison can blend in well with the prairie when they lay down among the tallgrass. Jones said one of her graduate students ran into a mom bedded down in the grass—luckily the mom ran off—while another student got a dent in their car because it turns out vehicles are perfect bison scratching post. Bringing bison back East may seem like a lot of effort for not a lot of return. The prairie that once was is never coming back given that much of it is now the American Breadbasket. And the parts that have been saved and restored are an imitation of what they once were. But even those imitations can spark the imagination and a connection to something deeper that’s hard to let go of. “As a scientist to walk up to a research site that is all prairie as far as the eye can see with bison dotting the landscape, that’s as magical and spiritual as it gets,” Jones said.